So you will know where I’m coming from up front I want you to take your dogs camping. You take the kids so why not the dog. For those who agree, this post is meant to help you when taking your dogs camping. The post that prompted this post is shown below. 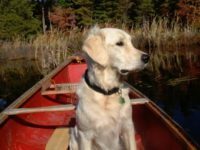 It has some great points about preparing your your dog for your next camping trip. If you can believe it, not everyone in this world loves dogs! I know, I was shocked too, but it’s true. And due to that fact, not all places allow animals. Call ahead if you are staying in a national park or maintained campsite to find out what the rules are pertaining to animals. Make sure your dogs are healthy. Get your dogs up to date on their shots, or make sure you have enough of their medication on hand. Even taking a copy of the health records is not a bad idea. Make sure they have tags with their name and your phone number on their collar. If you are going to be staying at one site for an extended period, it would be helpful if you had temporary tags made that listed the campsite number where you are staying. Baggies/ Pooper-Scooper – nothing worse than stepping in somebody else dog’s poo – Clean it up! Flea Collars/ Animal Safe Insect Repelant – they hate being attacked by bugs just like we do! Take Breaks – if you are traveling for a long time, make sure you stop and allow them to get out and stretch their legs and take potty breaks. Please do not lock your dog in a car or RV during the day….the temps can become unbearably hot in just a few minutes. Once you arrive, make sure your dog is being courteous to your camping neighbors – you don’t want to get off on the wrong foot. Be aware of your dog’s athletic ability – if he hasn’t been walked in a while, he’s probably not ready for the 5 mile hike! Do not let the dog or the dog’s food spend the night outside – there are many critters that can be dangerous. I hope this helped you and Fido to discover a wonderful camping trip had by all. If you have any other tips, please help us all and leave a comment! Great common sense info right. You would be surprised how many folks throw Fido in the car without thinking of the above all important items. The only thing I would add to their very complete list is a dog crate. I would like to know that when Fido isn’t walking or playing with the kids he is in his dog crate and not staked out lake bait in a Jurassic movie waiting to be eaten by a critter or a larger dog. You know those people with the huge dog, he always comes when they call him right, not so much. You don’t want little Fido to become food for the “Jurassic Monster.” So take your dog crate along. You have room. You say you will keep the dog in the tent with you. I would ask you how much you value the floor of your tent. Little paws, little claws mean big holes in your tent floor. And remember. . . . . . So the next time you are considering a camping trip include Fido and all his “stuff” along with the family, yes, take your dogs camping. They will love you for it plus they will sleep for days when they get home. After all they are part of your family. Don’t forget to visit Campfire Logic for tons of great information to enhance your camping experience. I think other web site owners should take this website as an model – very clean and fantastic style and design, as well as the content. You are an expert in this topic! thanks for the article, I will be going camping in about a month and will be taking my dog with me, he loves it. Rather nice post. I just stumbled upon your webpage and wanted to say that I’ve seriously loved looking your web site posts. In any case I? ?ll be subscribing to your feed and i hope you be able to write again soon!